Nick + Kelly Reding and GK Meyer crafted a cabin with historical charm and rustic luxury. Nick Reding is the author of the best-selling book “Methland: The Death and Life of an American Small Town” and a full-time family man. All that and the owner of a piece of rejuvenated Missouri history. 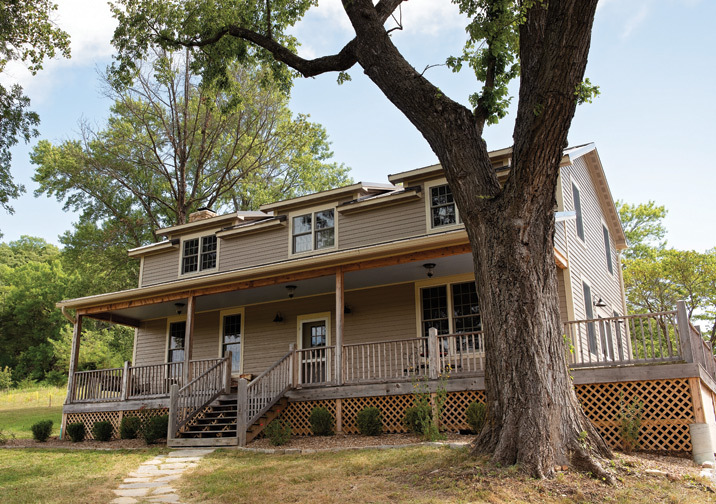 With the help of Gary and Donna Meyer of GK Meyer Construction, Reding was able to take what was a dilapidated shack and turn it into an energy-efficient weekend home that would make the journeymen of the era proud. When Reding purchased this cabin back in 2015, he knew that it would be a perfect spot for his family to spend relaxing weekends. As he puts it, “My wife is from upstate New York originally and surprisingly this area in St. Louis County looks very similar to where she grew up, so I knew that would be a great fit for her and the family.” But that's just the start. There was still a long way to go before this rustic homestead was a home. Reding continues, “It was a real hodgepodge of a cabin. It had all this multi-faceted, historical character, but it wasn't anywhere near liveable.” The goals that the Reding family had for this remodel were to keep that rich history by keeping as much of the old as possible while adding the modern comforts that we've all come to expect in a home. That's where GK Meyer comes in. They focus on not only building phenomenal log homes, but also researching them, too. By their estimates, this cabin was built in the early 1800s and had been added onto many times, slowly replacing parts of the original structure as needed with whatever materials and methods were available at the time. In fact, the only thing remaining from the original structure was one log wall. It had archaic features like limestone insulation, a forgotten cistern and timber walls and floors that were falling apart. Another of the amazing features is the cedar deck, which Donna adores, made completely from trees on the property. She gushes, “I love the wrap around porch and the beadboard ceiling. There are several pieces of furniture that were found on the premises that I cleaned up and clear-coated to let the old finishes show through.” They also added a solar array, so that they could continue to preserve the area and stay energy efficient. As for that old cistern, it's now a huge and lavish BBQ pit.